This is indeed a little book. Each of the 50 tips is two or three sentences longthat's the whole book. 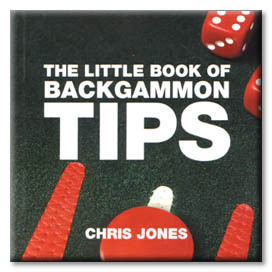 COVER: 50 invaluable tips for backgammon players. Want to win at backgammon? Easy: just play with the odds. This guide shows how a simple understanding of the dice-throw can improve your every move. There's advice on opening throws, how (and when) to block and run, hitting and being hit, bearing off, back games, using the doubling cube, and lots more. You're odds-on to double and redouble your success with this Little Book on board. AUTHOR: Chris Jones somehow finds time to be an educational writer in between playing bridge, Scrabble, backgammon and cribbage, and solving and writing cryptic crosswords. He learned to play backgammon while teaching in Beirut in the late 70s, and retains a fondness for the noisy wooden boards which are commonly found in cafes around the Mediterranean and which led the French to name their version of the game "tric-trac." What better accompaniment for a cold beer under a shady olive tree on a balmy Mediterranean beach?